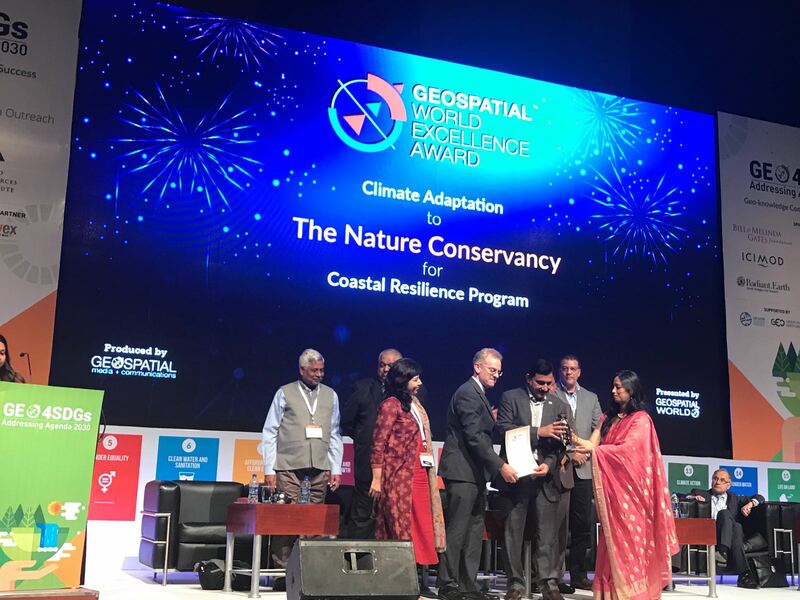 Coastal Resilience receives Geospatial Excellence Award at the Geospatial World Forum in Hyderabad, India, on January 19, 2018. Coastal Resilience, a program led by The Nature Conservancy to examine nature’s role in reducing coastal flooding risk, was honored with a Geospatial World Excellence award for its state-of-the-art mapping technology. The mapping technology, the driving force of the Coastal Resilience program, was built to support decision around land-use and climate adaptation planning. The award will be presented at the Geospatial World Forum 2018 in Hyderabad, India on January 19th. The Forum represents the largest gathering of the international geospatial community, highlighting the power of geospatial technology to address global social and economic issues. Zach Ferdana, Senior Program Manager at the Conservancy, attended the 2018 Geospatial World Forum. Coastal Resilience was developed in 2007 to work with local communities to map sea level rise, storm surge, socioeconomic assets, community vulnerability; and examine nature’s role in reducing coastal flood risk. Through a growing public-private partnership, the program, rooted in an online geospatial decision support tool, has reached 17 coastal states in the U.S., and globally across the Caribbean, Mexico and Central America, and most recently in Southeast Asia and Australia. The online tool contains data for local municipalities, regional and national agency land-use decision-making and policy creation, as well as global information to support conservation and cost-benefit analyses for multi-national businesses and development banks. The public-private partnership born out of the program includes members of government agencies of all scales, academia, engineering, insurance, international development, other nonprofits, software technology, and multi-national institutions. In the program’s ten years, it has reached over 100 communities around the world in a wide range of social-ecological systems, providing users with data to assess vulnerability and identify and implement nature-based, risk reduction solutions. Successes include, but are not limited to: guiding U.S. sea level rise policy; identifying open space preservation and flood insurance reduction opportunities in the Southeast U.S.; calculating the cost-benefit ratio of different types of coastal infrastructure with the hotel industry and Swiss Re in Mexico; responding to the 2010 Gulf of Mexico oil spill with tools to address oyster reef restoration; and building a cooperative agreement to manage naval base strategic retreat with the Navy in Ventura County, California. The program has been so successful that it’s framework has been applied to climate adaptation planning in land and freshwater environments, encompassed in our Natural Solutions Toolkit. A marsh in Louisiana that is part of TNC’s conservation efforts across the Gulf of Mexico to improve floodplain management through restoring and protecting natural systems across political boundaries. Photo credit: Carlton Ward Jr. This award not only brings recognition to the outstanding growth and impact the program has had over the last decade, but it also helps to broaden its reach in coastal communities internationally. As technology improves and our program continues to grow, we are addressing the most pressing conservation decisions and developing groundbreaking methods for climate adaptation and risk reduction. As Coastal Resilience embarks on its 11th year, we’re excited about innovative bodies of work with new partners including Microsoft and the Red Cross. We’re expanding the reach of our community vulnerability assessment and nature-based solution identification processes by working directly with the Red Cross in Southeast Asia and the Caribbean, to ensure the development of coupled social and ecological resilience. To further our program’s domestic work supporting coastal habitat conservation within the National Flood Insurance Program, we’re working with our partners at Microsoft to apply a Microsoft machine learning algorithm and artificial intelligence to identify areas that will contribute to improved floodplain management if conserved. It’s been a big year for Coastal Resilience, and we’re confident that these partnerships and upcoming innovative bodies of work will continue to pioneer the way technology can inform conservation and risk reduction.